Sample Introductory Speeches that Honor your Distinguished Speaker. Sample introductory speeches don't come better than an introductory speech for Usain Bolt. Wow! Who will ever forget his moment of glory as he did his victory lap after winning 3 golds and smashing world records at the Olympics? Take a look, read, adapt and in record breaking speed you'll have a great speech. It is both and honor and a privilege to be able to introduce you to a role model of note, a man of distinction - Usain bolt. Usain Bolt is a Jamaican sprinter and he was born on 21st of August 1986. Usain has distinguished himself as a world class sprinter and he holds the Olympic and World Records for the 100 meters in 9.69 seconds and the 200 meters in 19.30 seconds. Usain has taken his level of excellence one step further - and together with his teammates - he also won the 4X100 meters relay in the amazing time of 37.10 seconds. What makes Usain's achievements all the more remarkable is the fact that they were all set at the 2008 Summer Olympics. Usain became the first man to win all three events at a single Olympics since Carl Lewis in 1984 and the fist man in history to set world records in all three events at a single Olympics. 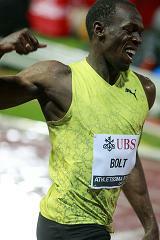 His name and his achievements in sprinting have earned him the media nickname "Lightning Bolt". I am sure that you all know a great deal about his public sprinting life, but there is more to Usain than just running. Sidebar: great sample introductory speeches always show the speaker's human side too. Usain enjoys dancing and he is often described as a laid-back and relaxed character. The first sport to interest him was cricket and he said that if he was not a sprinter, he would be a fast bowler instead. He is a fan of Sachin Tendulkar, Chris Gayle and Matthew Hayden. Ladies and Gentlemen, I'm sure you will agree that the world of cricket has lost out - but the world of sprinting has gained a legendary role-model. Please join me in welcoming Usain Bolt to address you this morning with his words of wisdom. Our sample introductory speeches are based on less-is-more. Your introduction speech should welcome and honor your guest speaker, not steal their limelight.